I asked for feedback in my Book Giveaway post (Today is your last chance to enter!) and one response said they wanted to hear more about classroom management. I agree that this is one of the main things I struggled with my first year teaching, mostly because it is not something you can learn well in listening to a lecture in college. You have to learn by fire in the classroom. I think I actually learned more about classroom management from being a camp counselor for elementary students than I ever did during college. I think the best thing to do is focus on classroom routines and relationships. If you can take care of those things, there are few opportunities to actually have to "manage" anything. 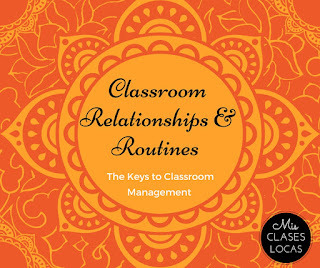 To learn more about building relationships in the classroom read up on Grant Boulanger's blog. His Spanish 1 curriculum is based on the students in his class. He teaches with comprehensible input with everything focusing on his students. If you focus on building relationships as your number one priority, your students will know you care, and will care about each other. If everyone feels valued and accepted there is little chance for behavior issues, because everyone keeps each other accountable about the classroom family. How can you build better relationships with students? Here are a few ideas. Have students fill out interest questionnaires at the start of the year & look at them periodically to remind yourself what students are really into. I do a Google Form. Always spend passing time in the hallways chatting with students and greeting those entering class. Attend out of school events such as concerts, games and school dances. Then talk about these events the next day praising all of those involved. Use PQA (Personalized question-answer) all the time. Involve your students in your weekend talk, vocabulary introductions, stories and everything else. Cater class to what your students are interested in and want to talk about. Notice the little things. Complement new haircuts, shoes and those who hold doors for others. If a student looks really down, pull them aside and ask of there is anything they need. Don't let any student go through a day without someone telling them something positive. 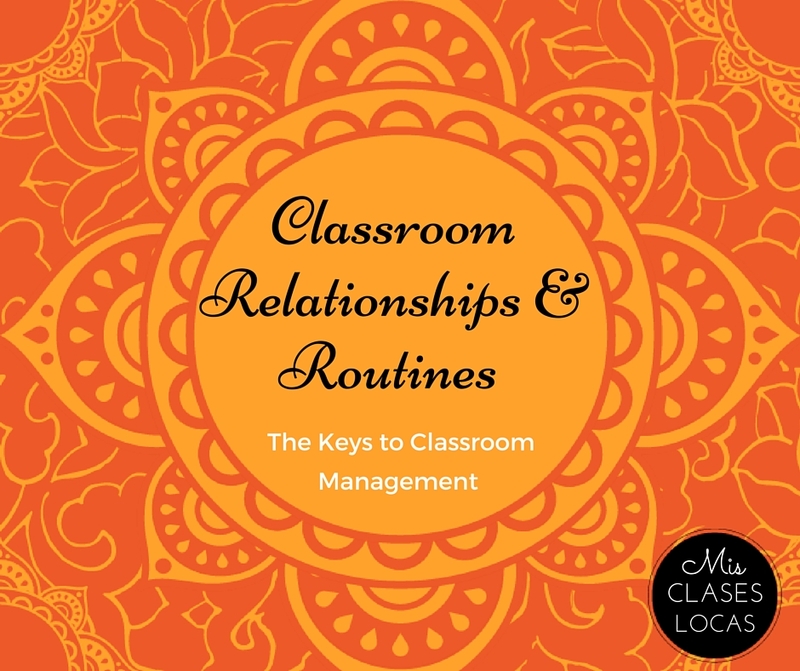 Personally, along with building relationships, classroom routines have helped me to curb possible "management opportunities." These are all things that must be taught and reinforced to work effectively. Put away all electronics, which includes having their Chromebook closed (unless there are instructions on the board to have it out for a task). Go to their assigned seat. (A well made seating chart is an excellent management tool). Complete their Para Empezar bell ringer task of the day, which is projected on the board. Friday - baile viernes - video playing & students immediately start dancing. This is followed by VIERNES chant. My upper level classes then watch El Internado each Friday. When I do an attention getter, students are to respond and stop what they are doing to listen. These include call and response such as this one from @SenorG T -"listos, listos" Students- "Sí, estamos listos"
If supplies such as scissors or colored pencils are needed, 1 volunteer from the table goes to get enough of these items from the communal shelf for the table. If a student is going above and beyond, they are given a chile, which can be redeemed later for prizes such as sitting in the comfy chair. If they have presented in Spanish in front of class and need even more recognition, we give them a Positive validation. When students leave the room, they are to leave it better than they found it, cleaning up their are and pushing in chairs. For other ideas, here are all posts labeled classroom management. Below are more specific posts on the topic as well. What are your best classroom routines? If you ever have ideas about what you would like to see on the blog, please let me know! Don't forget to enter the Book Giveaway by midnight Today! Hi Allison! Thanks for this post; underneath all that we do, classroom management is definitely the hardest thing for me! I also love that you started with happy and positive things! For your bellwork, do you collect it? Do you grade it? Do students stay on task? I'm having trouble deciding if I want to keep mine around; I love the structure but not sure if my students view it as helpful. I'd love to hear your thoughts! For reading they have a log that I collect at the end of the trimester.